Bosak, S., et al. (2017). Phytoplankton Species Composition Contributing to Carbon Export – Sea to Space Particle Investigation. Poster Presentation at 11th International Phycological Congress, Szczecin, POLAND. Cetinic, I., et. al. (2017). Sea to Space Particle Investigation Expedition in the Pacific. Invited Lecture to NASA Goddard Space Flight Center, Sciences and Exploration Directorate Greenbelt, MD, USA. Cetinic, I., et. al. (2017). Sea to Space Particle Investigation. Poster Presentation at Ocean Carbon Biogeochemistry Summer Workshop, Woods Hole, MA, USA. Cetinic, I., et. al. (2017). Sea2Space. Invited Colloquium to NASA Goddard Space Flight Center, Education and Communication Greenbelt, MD, USA. Durkin, C. (2017). Linking Phytoplankton with Sinking Particles and Carbon Export. Invited Lecture to University of California Santa Cruz, Santa Cruz, CA, USA. Durkin, C., et al. (2017). Linking Surface Phytoplankton with Sinking Particles. Poster Presentation at CLIVAR/OCB Ocean Hotspots Workshop, Moss Landing, CA, USA. Durkin, C., et. al. (2017). Linking Surface Phytoplankton with Sinking Particles. Poster Presentation at Ocean Carbon Biogeochemistry Summer Workshop, Woods Hole, MA, USA. Knorlein, B. (2017). From Sea to Space: Application of Virtual Reality in Science. Invited Lecture to NASA Goddard Space Flight Center, Greenbelt, MD, USA. Ljubešić, Z. (2017). Development of Methods for the Phytoplankton Research in the Adriatic Sea. Invited Lecture to Croatian Academy for Sciences and Arts, Zagreb, CROATIA. Ljubešić, Z.. (2017). From Microscopes to Telescopes. Invited Lecture to University of Zagreb, Zagreb, CROATIA. Omand, M. (2017). Carbon Export Processes at Meso- and Submesoscales. Invited Lecture at Ocean Carbon Biogeochemistry Summer Workshop, Woods Hole, MA, USA. Omand, M. (2017). Diel Rhythms in Phytoplankton Physiology and Marine Snow Export Observed from a Wirewalker Autonomous Platform. Invited Lecture to Rutgers University, New Brunswick, NJ, USA. Omand, M. (2017). Diel Rhythms in Phytoplankton Physiology and Marine Snow Export Observed from a Wirewalker Autonomous Platform. Invited Lecture to University of Rhode Island, Narragansett, RI, USA. Omand, M., Cetinic, I., and Lucas, A. (2017). Using Bio-optics to Reveal Phytoplankton Physiology from a Wirewalker Autonomous Platform. Oceanography 30(2):128-131, doi: 10.5670/oceanog.2017.233. Schollaert Uz, S. (2017). Microscopic Life in a Moving Ocean. Invited Lecture to Baltimore Science Fiction Convention, Baltimore, MD, USA. Visic, H. (2017). Chemotaxanomic and Morphological Approach to Phytoplankton Analyses in Contrasting Trophic Systems of North Pacific. Masters of Science Thesis at the University of Zagreb. Walcutt, N., et. al. (2017). Assessment of Holographic Microscopy for Quantifying Marine Particles. Poster Presentation at Ocean Carbon Biogeochemistry Summer Workshop, Woods Hole, MA, USA. Walcutt, N., Knorlein, B., Sgouros, T., and M. Omand. (2017). 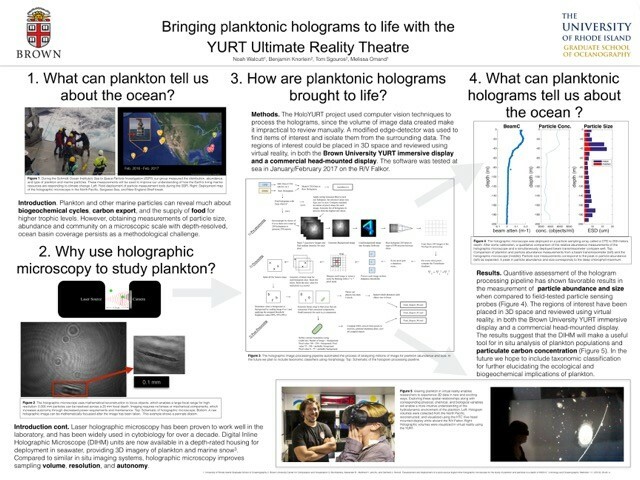 Bringing Planktonic Holograms to Life with the YURT Ultimate Reality Theatre. Poster Presentation at Rhode Island EPSCoR Research Symposium, Providence, RI, USA. Walcutt, N., Knorlein, B., Sgouros, T., and Omand, M. (2017). Bringing Planktonic Holograms to Life with the YURT Ultimate Reality Theatre. Poster Presentation at the Rhode Island EPSCoR Research Symposium, Providence, RI, USA.